3 Bedroom Flat For Sale in Falmouth for £445,000. 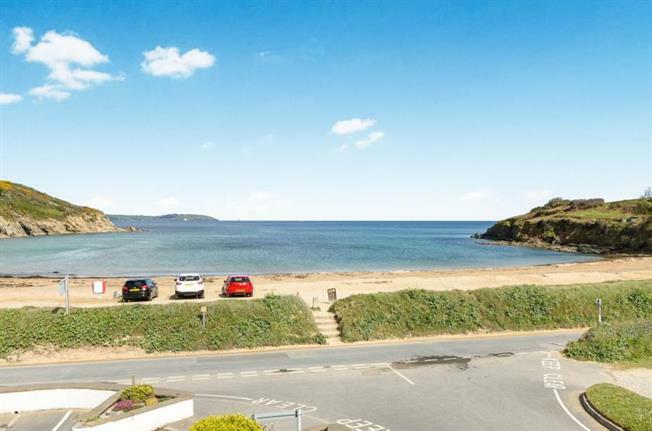 This stunning apartment enjoys one of the best positions at Maenporth being at The Cove, it has superb open plan accommodation with a roof terrace boasting views directly out over Maenporth beach and cove. With three bedrooms and two parking spaces this is an ideal holiday retreat. The kitchen area is fitted with a range of modern base and eye level units with granite work tops over and inset sink and drainer with tiled surround. The kitchen is fully integrated including an oven, hob and extractor hood, fridge/freezer, dishwasher and washing machine. This extremely light and spacious room features dual aspect windows with a window to the side aspect enjoying a lovely rural outlook and double doors leading to the roof terrace and enjoying a stunning view across the Cove. There is a large double airing cupboard and three radiators. Fitted with a modern suite comprising a fully tiled shower cubicle, pedestal wash hand basin, close coupled WC, heated towel rail and extractor fan. With windows to the rear and side aspects, and a radiator. The bathroom is fully tiled and is fitted with a modern white suite comprising a panel bath with mixer tap, shower attachment and screen, pedestal wash hand basin, close coupled WC, bidet and window to the rear aspect. There is allocated parking in the residents' carpark to the front of the building.